John (Jack) Ralph Piper graduated as Navigator at No. 1 Observers School in Toronto. He was not the only future Mooseman to complete training at the base located near Toronto. The news clipping in the photo pages of John Piper also show Vince Cleveland who would also be posted in the future to 419 squadron. Although a dream base to be posted to in terms of any Leave that may be given, the base also was as one veteran mentioned to me as a "VIP Hangout" ( deleteing of course the other adjectives he included). Politicians who wanted photo ops with the "boys" frequently dropped by. Meaning time spent on Parade and the normal spit and polish associated with such events instead of the flying the airmen wanted to be doing. As Navigator in training future F/O Piper would be required to take the aircraft, normally one of two engine aircraft found on base, provide the pilot with directions to make it to points set out by instructors to two or three different "targets" around province then get the aircraft back to base. All of course while sitting at his plotting table in the back of an Anson with the windows blacked out. The point of the exercise was to make it to each of the assigned targets, on time and to return to base on time. Although Piper never made such errors. Other RCAF trainers from No.1 OTS were found flying off course and giving the citizens of Buffalo New York a view of one of Canada's Yellow painted trainers. Once overseas his next step would be a Operation Training Unit, it would here that he became part of Sgt. MacLeod's crew. From the OTU the crew were next posted to No.1664 CU at Croft. He and the crew put together by pilot Sgt. 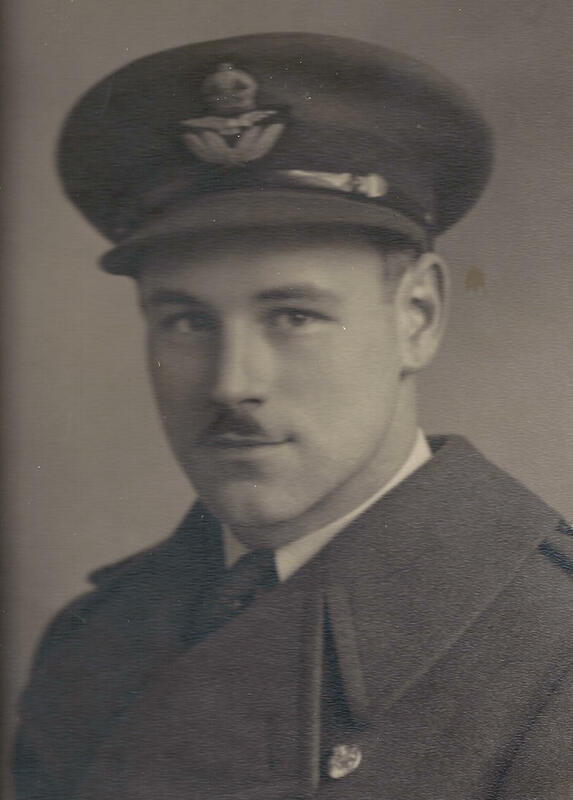 Douglas MacLeod arrived at 419 squadron on October 28th 1943. The crew would take part in additional training at Middleton St. George with their captain MacLeod. While they awaited MacLeod's compulsary completion of 2nd. Pilot training. With these completed on November 18/19th, the crew each morning would read the Battle Order posted to find out when their first operation would take place. The wait was short the very next squadron operation was on the night of November 22/23 and their names appeared on the Battle Order, assigned to Halifax JP119, VR-O. Battle Orders posted only showed which crews were on for that night and their aircraft, but the actual target would be found out at breifings later. When the breifing time came veterans of other operations would try to guess what target would be revealed from under the covered maps and black boards as they entered the breifing room. The petrol loads and other general information would be visable, large quantities of petrol would indicate operations deep into Germany. I am told you could feel the tension in the room change as the crews filed in and looked at these notations. F/O Piper would find that his first operational target would be Belin. The crew's first full operation would be a hard one. 26 aircraft were lost on this operation. F/O Piper would then be the Navigator on two more operations over the German capital of Berlin. Then the crew once more were faced with an operation to Leipzig, a former target that had caused them problems back in the beginning of December. At 2312 hours on the night of February 19th, JD114 joined up with 823 other bomber aircraft all headed to Leipzig. A smaller diversionary force was to have attracted the enemy fighters from the main force. But German controllers only sent part of the available night-fighters up to meet the diversion aircraft. They then called back that force of fighters when they saw what the main target was. Bombers were attacked all the way to the target, things were not any better over the target, winds brought bombers too early and thay had to circle and wait for the Pathfinders. Four aircraft were lost to mid air collisions and 20 were lost to the heavy flak over the city. In all 78 bombers were lost. 419 would loose two crews in this disastrous raid, one of them was the Halifax carrying F/O Jack Piper. No details of what actually happened to his aircraft were ever found. He and the other crew men are remembered on the Runnymede Memorial.